We live in a strange time; a time in which 500-plus horsepower family ‘super sedans’ run wild and, as a result, having “onlyâ€ 435 horsepower makes you the small kid on the block. However nonsensical and surreal such a scenario may seem, this is the automotive hierarchy in which the 2008 Audi S6 was born. Thinking the S6 is “underpowered,â€ however, would mean you have been duped into a top-down perspective due to the lofty power ratings of its competitors, because when the S6 kicks you in the back of the head with its V-10 power, it does so with brutal authority. Freeway acceleration makes it clear that the S6 was designed for Autobahn speed, as does the comfort level of the cabin, which makes long trips a borderline pleasure. With Quattro all-wheel drive, the S6 remains dreary-weather compatible and, in snow-laden markets, it’s hard to argue a case for any other performance sedan. Effortless, extreme acceleration is always available and is paired with top-notch interior build quality and luxury. Standard Quattro all-wheel drive, along with a lower base price, gives the S6 a distinct advantage over its competitors. With ten cylinders under the hood, the frequency with which you will visit the gas pump is disturbing at best; a 21.1 gallon tank helps extend the S6’s range some, though filling it once the tank is drained will result in a large, very large, lump-sum payment. Pressing the gas pedal in the S6 has its consequences. The world outside the car’s cabin suddenly becomes a blur, overlaid by the mechanical churn of a 5.2-liter V-10 exhaling in anger. Be warned, first time passengers are likely to panic; either audibly or physically by grabbing onto the door handle, such is the insanity with which the S6 is flung forward. Weighing in at just under 4,500 lbs, the Audi amazingly manages to run from 0-60 mph in just 5.1 seconds, though it’s most impressive between 40 and 130 mph once all of its mass is up to speed. The suspension is heavily sprung, making the big Audi feel taught but never overly rough. In the corners, the S6 is not betrayed by its steering or suspension characteristics – and certainly not its brakes, which are excellent – but again by the fact that it cannot overcome inertia, and isn’t keen to change direction quickly. The grip afforded by Quattro all-wheel drive keeps the tail from coming around, even with the stability control switched off. The S6 is powered by a torque-laden 5.2-liter V-10 that revs to a lofty 7,000 rpm. Those ten cylinders combine to produce 435 horsepower and 398 lb-ft of torque at a low 3,000 rpm. All of this power is transmitted through all four wheels and only an automatic gearbox is available, though it incorporates both an automated sport mode which holds gears longer and downshifts earlier, along with steering wheel mounted paddle shifters for when manual shifting is preferred. While the baseline S6 includes quite the comprehensive range of features, most will want to opt for the $3,350 Technology Package, which adds voice control, an advanced key for keyless start and entry, Audi’s parking assistance system with integrated rearview camera and a DVD-based navigation system operated by Audi’s wheel and click Multi Media Interface (MMI) system. Other options include a warm weather package, adaptive cruise control, Audi lane assist, various interior aesthetic upgrades and an iPod connection, which pairs well with Audi’s MMI interface but can be difficult to connect while driving due the cord being located in the glove box. Audi’s legendary Quattro all-wheel drive system is the cornerstone of the S6’s handling dynamics, transferring power to the wheels with the most grip and utilizing a standard rearward torque bias of 60 percent rear, 40 percent front. The controls for Audi’s Multi Media Interface are located on the center console around the gear selector and manipulate a centrally mounted 7-inch, high-resolution screen to control stereo, communications and climate control functions, among others. While there are ten cylinders under the hood, a relatively modest 5.2-liter displacement keeps the S6’s fuel consumption at a tolerable 15 mpg city and 21 mpg highway, not bad considering a V-8 powered A6 returns 16 city/21 highway, and both the V-10 and V-8 manage an identical combined cycle of 18 mpg. Emissions receive a LEV-II rating. The interior of the Audi S6 blends sophistication and sport, feeling like a combination of the RS4’s raw aggression and the S8’s luxury, though we’d hardly argue that this is coincidental. Birch wood accents and inlays are fitted to the flawlessly stitched dash as standard, though modern carbon fiber trim is available as an option. The S6 carries only a few subtle clues that set it aside from the standard A6, the most obvious of which being the “V10â€ badges stuck below its side markers and the S6 badge pinned to its tail. 19-inch alloys, upgraded brakes and attention-grabbing LED fog light strips up front complete the list of standout exterior items. With an MSRP of $72,350, V-10 power and Audi luxury prove an expensive combination. However as a matter of perspective, the less-powerful S6 is properly priced below its main competitors, the $85,300 Mercedes-Benz E63 AMG and the $82,900 BMW M5, though it does come in about $10,000 above the similarly-able 420 hp Jaguar XF Supercharged. 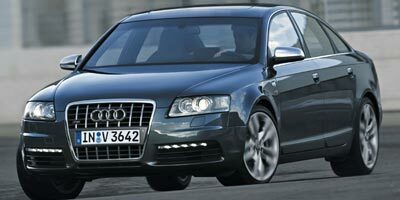 The Audi S6 offers and amazing blend of exhilarating performance, luxury, usability and subdued force. Though it might lack the outright grunt of its homeland competition, you’d be hard-pressed to complain that 435 hp is “not enough,â€ especially when coupled with such a well-appointed interior.